RAPAPORT... The Hong Kong Jewellery and Gem Fair that took place this week reassured the diamond trade that things are not quite as bad as they seem. There were a high number of visitors at the show and buyers were looking at goods even if sales were mediocre. Overall, the show was better than expected. Mind you, expectations within the diamond trade were relatively low. The market has been fairly weak in the past few months and polished prices softened in the run up to the show. Furthermore, there has been underlying uncertainty about the market in China as economic growth has slowed and jewelry sales have slumped compared to last year’s gold-driven highs. Therefore, while there was still a steady flow of visitors at press time at the end of the fourth day of the show, the mood remained positive on the trading floor. At least there was interest in the market. The market is not booming. On average, there was a slight softening of prices at the show, largely as manufacturers sought to raise liquidity levels. Those who lowered their prices were able to sell off some inventory. In addition, the busy traffic provided hope that there might be a strong follow up after the show. Significantly, after the quiet trading in July and August, the September Hong Kong show at least signaled for many that the long summer is finally over. 1. Liquidity is, indeed, tight. The lack of liquidity in the midstream has caused a degree of panic among manufacturers and dealers. A number of factors have caused the liquidity crunch: primarily, third quarter polished sales have been slow so far; cash flow from polished sales have been delayed by the long turnaround time at the Gemological Institute of America (GIA); margins are tight as rough prices have remained relatively firm since April – with some softening in recent weeks – while polished prices have declined; and finally, the banks have reduced their credit to the industry. As a result, the liquidity panic among dealers was sensed by buyers at the show. Accordingly, they pushed for higher discounts seeking out distressed sellers, did a fair bit of window shopping and price comparing, and waited around to see if prices might drop further. The dynamic of the show was largely determined by suppliers who were prepared to lower prices in order to generate liquidity, and Chinese buyers who were not yet ready to build up inventory. Furthermore, many exhibitors noted that buyers are also short of cash and were buying goods with terms and on consignment, despite being offered a few extra percent discount for a cash deal. 2. It’s not necessarily about price. There was tension between the suppliers with liquidity and those lacking liquidity. That affected buyers’ confidence as there was some discrepancy on prices between companies that were willing to sell cheap in order to generate cash flow, and those that sought value for their goods and held their prices firm. There are strong suppliers in the market with healthy liquidity levels, and the show was not bad for them. For these diamantaires it’s not all about price, as the core retail buyers in the region are looking for reliable suppliers they can trust with good service and consistent pricing. While there are always bargain hunters, the serious buyers do not want to see daily volatility in a supplier’s price list. Both suppliers and buyers recognize that the diamond business is about relationships, and the show presented an opportunity to build long-lasting ones. Numerous exhibitors said they met new customers, or gained strong leads for future business after the show. •	There is good demand for GIA dossiers, but profitability is low on these goods. •	Demand for small dossiers, 0.30-carat to 0.40-carat has softened slightly. •	Demand for 2-carat and larger diamonds is relatively slow. •	There is stable demand for commercial-quality, 10-carat and larger, G-, VS2- stones. •	High-end, large stones are weak. •	There is a general shift away from D-F, FL-VVS goods toward lower colors and clarities in all sizes. •	There is steady demand for small melee goods. •	Fancy shapes are stable with cushions and ovals being the most popular shapes, followed by pears, while demand for other shapes is relatively weak. •	Fancy-colored diamonds continue to be strong, especially fancy intense yellows, blues, and pinks. •	Large fancy colors are weak, while there is good demand for 1-carat to 3-carat, FL-VVS goods. Inventory is typically high at the beginning of September but many exhibitors said they came to Hong Kong with more goods than in previous years. In particular, many noted that there has been an influx of 1-carat and larger diamonds to the market as the GIA has increased its turnaround time for these goods. That said, there were no suggestions of an oversupply of goods in the market. If anything, dealers reported a shortage of in-demand stones. 4. There’s no business like show business. There are a lot of trade shows on the diamond market’s calendar and a certain amount of show fatigue among the trade. Yet the September Hong Kong show is one of the more important events on the circuit. Not only does it provide a gateway to the important China and Far East market, but it also sets a tone for the trade ahead of the holiday season. As the show exceeded low expectations, dealers will leave Hong Kong in a more positive mood than when they arrived. However, there are a few caveats to the success of the Hong Kong show. Security was a serious issue this year as there were a number of incidents of theft in the diamond hall. Furthermore, diamond exhibitors are still frustrated that they are located at AsiaWorld Expo, which is about an hour shuttle bus ride from the Hong Kong Convention and Exhibition Centre where the main jewelry exhibition takes place. Organizers might want to do more to reassure the 435 diamond exhibitors that they are gaining maximum exposure in a safe environment at the show. As in any business, a trade show needs to show its added value to the market, or fulfill a niche that none other provides. This week’s Hong Kong show did that. 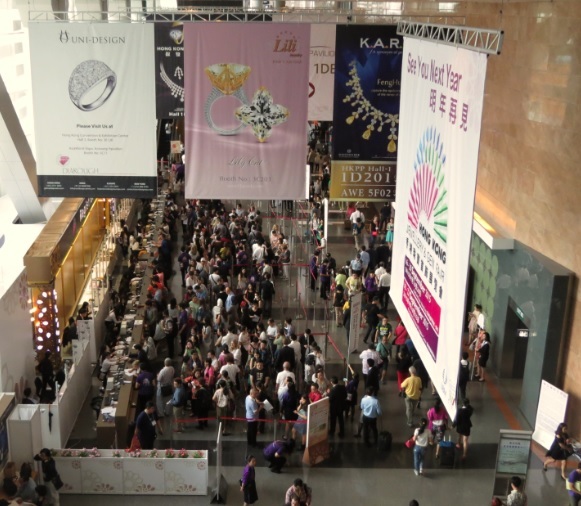 Buyers go to the September show as they start to prepare for the Chinese New Year that takes place on February 19, 2015, in much the same way that U.S. buyers go to the June JCK Las Vegas show with Christmas in mind. Therefore, the industry can afford itself a positive outlook for the holiday season in China that begins on the October 1 National Day Golden Week and extends to the Chinese New Year. While economic growth is expected to slow to around 7 percent in 2015, China remains the growth engine for the diamond industry with great opportunities for the trade. There is some caution as the country matures and transitions from being a government investment-centric economy to being one driven by consumer spending. Wholesale buyers will naturally exert caution in an environment of transition. However, while that will likely bring some growing pains, an increase in consumer spending is ultimately a positive trend for the diamond and jewelry industry. This week’s Hong Kong fair provided some reassurance that there is sufficient demand to allow the diamond trade to navigate any short-term uncertainty in the Far East, and indeed, take advantage of the long-term growth potential that is very evident in China and the Far East region. Whether the trade can navigate the inconsistencies and volatility within the dealer market that was evident this past week might prove to be a greater challenge.